Grenadine is a classic ingredient in worldwide bar mixology. Grenadine derives its name from the French word for Pomegranate (Grenade); as it was originally derived from pomegranate juice. 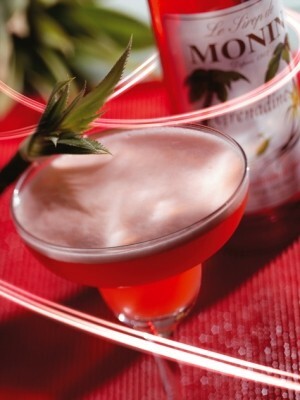 MONIN Grenadine Syrup presents a flavor of red berries and a touch of vanilla, with a vivid red color perfect for a wide range of cocktails and non alcoholic beverages. Made with select ingredients and pure cane sugar, MONIN Grenadine Syrup is a highly concentrated, authentic flavoring offering exceptional versatility for creating specialty beverages. ...read more.